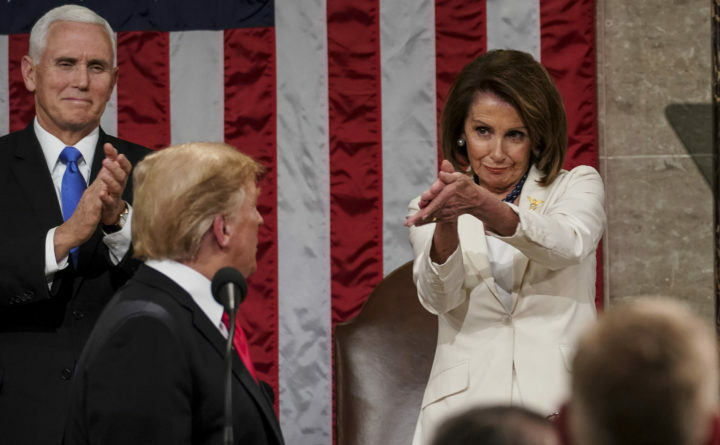 President Donald Trump turns to House speaker Nancy Pelosi of Calif., as he delivers his State of the Union address to a joint session of Congress on Capitol Hill in Washington, as Vice President Mike Pence watches, Tuesday, Feb. 5, 2019. He’s been driving in reverse, never even glancing at the rearview mirror. But Tuesday night, President Donald Trump stopped and put the car in drive. He hit some big bumps, of course, but his State of the Union speech was more than passable. It was well-delivered, made splendid points, afforded moments of heartwarming drama in balcony visits and was in many respect nearly the opposite of his shutdown. His shutdown maneuver, negotiating by not negotiating but punishing the innocent, worked to no avail except to punish himself and diminish the republic. In the speech, he reminded us of the best he has done and it did not bother me that modesty was not his calling card. Go ahead and brag, for instance, about reversing Obama-style regulatory madness and banishing tax rates thwarting an economy eager to boom. Trump spoke proudly of the consequences, the jobs created, the rising wages, the unemployment records that have especially benefited the down-and-out. More and more what it used to be, this economy of ours has been afire, No. 1, for instance, in oil and gas production with manufacturing taking off again. Of course, there are Democrats who fume at capitalist enthusiasm, such as Sen. Bernie Sanders whose face, unnervingly viewable on TV, writhed as he slunk in his chair, apparently hating it, too, when Venezuela came up. Millions are fleeing that once wealthy country and others are starving as dictatorial socialists get revenge on the poor as well as the rich, on liberty and on toilet paper no longer available. Socialism is increasingly praised as the solution for what — America’s capitalist prosperity? — and Trump brought it up, saying we would never be a socialist country. Trump made reference, too, to an unexpected side of him, a side that worked with both Democrats and Republicans to take important steps in reforming our prisons. Here’s a way to lower crime through teaching people skills they can employ in jobs when released and a means of beginning to depopulate the most populated prisons in the world. The president also got cheers from Democrats as well as Republicans when he talked about the economic empowerment of women, now at their highest job rate ever. Rep. Alexandria Ocasio-Cortez jumped to her feet when that was mentioned but seemed less certain when Trump asked an ICE officer to stand up in the balcony as he reported on human trafficking. After all, Cortez wants to abolish ICE, the law enforcement agency dealing with illegal immigration and such matters as sneaking girls and young women across the southern border for enslavement as prostitutes and the like. As Trump pointed out, the hero in the balcony and his colleagues have rescued 300 of these females. Taking perfectly reputable steps to deal further with such evils — a 240-mile barrier, technology, legal reforms, more security guards and new strategies — is itself evil, at least the barrier, according to House Speaker Nancy Pelosi. For what appear to be reasons as political as any Trump harbors, she is a persistent obstacle to moving forward. And let’s consider the evil, or at least the shabbiness, of that. Especially given the way the law works — step on our soil and you are usually free to wander and disappear — we now essentially have open borders facilitating misery and multitudinous deaths even as there also happen to be orderly, safe ways of providing legal immigration, including asylum. Trump did not bring up global warming, but there’s a human factor in Democratic solutions of the moment and they could be catastrophic. Some of his trade policies are bad mistakes. Debt is our biggest domestic issue and it escaped his attention. The call for political unity was needed but not the hint of another shutdown. Getting troops out of the Middle East? Maybe, if there is a reasonable fallback. I think Trump is right in wanting to rebuild the military and I loved his honoring old soldiers. It was overall a decent speech and we should thank Pelosi for allowing it. Jay Ambrose is an OpEd columnist for Tribune News Service.